We are proud to bring you the world's first kustomized, tattooed talking board. 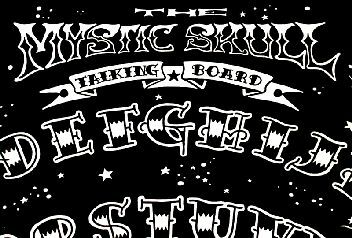 Made from Vampirahna's original hand-drawn artwork, in cooperation with the Zenrad Manufacturing Company, the MYSTIC SKULL is made with 100% REAL solid-black INK graphics, printed directly onto the board's surface. 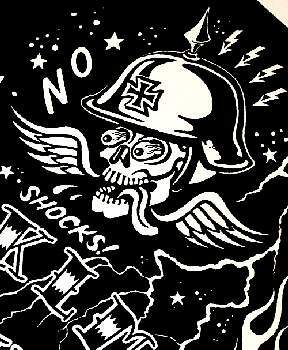 There are NO computer-generated stick-down decal type graphics of any kind upon this board. Great care and attention has been given to every detail of this full-sized (15" x 22" x ¼") talking board. 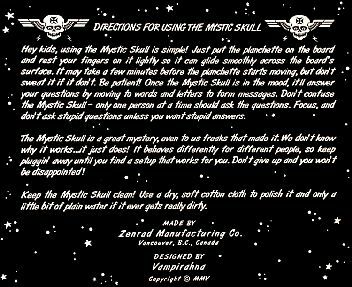 The time, effort, and skill that went into the creation of the MYSTIC SKULL are without doubt greater, and more elaborate, than any other current or antique talking board. 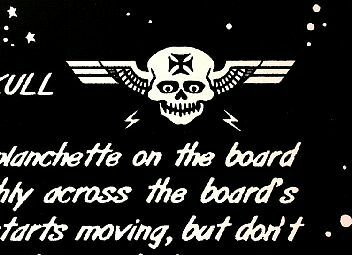 The board itself is a solid, heavy, and rigid press-wood with a smooth, hard, satin-gloss white surface on both sides that gives a truly wicked contrast with the black ink artwork. 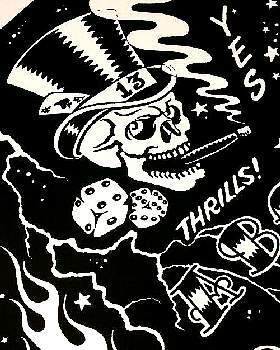 Unlike the lithographed paper or computer-generated boards commonly available today, this classic board should endure and still be highly sought after into the next century. Again, please note that this board is NOT some lame computer printout stuck onto a board. The graphics on this board are printed directly onto the board's surface. 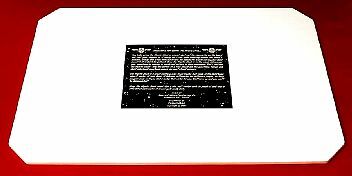 What you see is the board's white finished surface and the gloss black ink. There are NO decals of any kind upon the board. 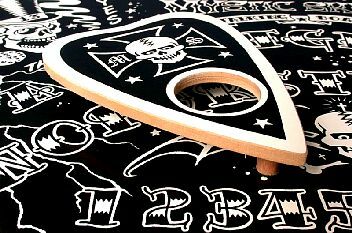 The planchette is a perfect complement to the board. 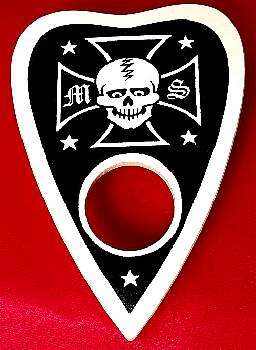 With its own Kustom graphics, it is a work of art in itself with a look unlike any other talking board ever made. 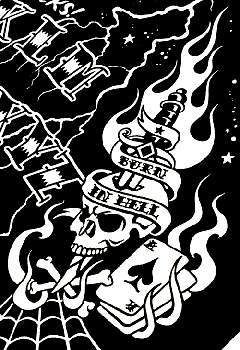 The back side of the MYSTIC SKULL has been designed as carefully as the front. 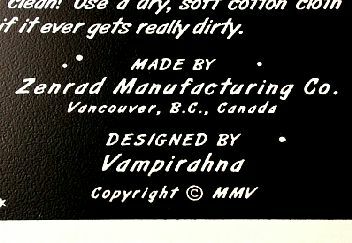 Note again that the images and instructions on the back are NOT a decal but printed directly on the board. 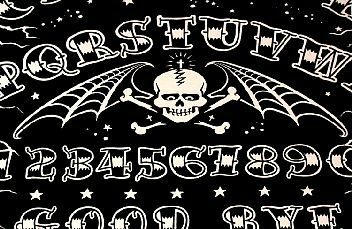 Achieving something of a landmark in traditional ouija board design, Vampirahna has added a unique twist by creating back-side artwork specifically for the MYSTIC SKULL rather than a "generic" block of unadorned instructional text as was common to antique ouija boards. 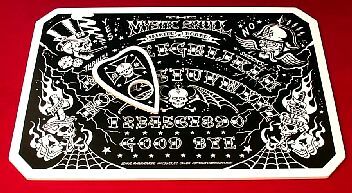 There is no other talking board set in the world that offers you this much REAL INK artwork on a full-sized board-and-planchette set for this low price! 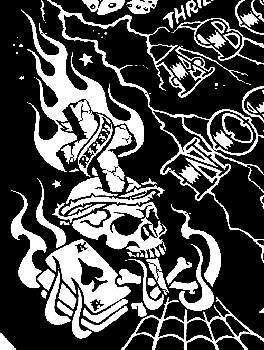 The MYSTIC SKULL must be seen in person to be truly appreciated!